When I wrote in the last magazine in January that “Spring is just around the corner, but this being the UK there may well be storms, rain and even snow to come” I had no idea how true that would prove to be! So this time I am forecasting warm sunny days! St George’s Players presented their “February Follies” in the church hall on Saturday 10th February. 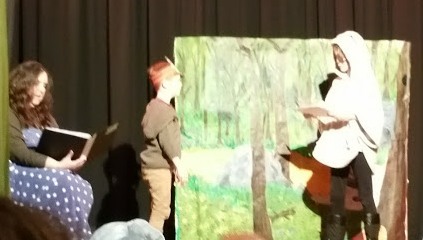 This included a variety of acts: comedy sketches, recitations, music and singing. At the ‘half-time’ interval teas and coffee were served. February 14th - Valentine’s Day, also Ash Wednesday and the beginning of Lent. There were services with “Ashing” at 10am and 7.30pm. Also the first of our fortnightly Lent Lunches, serving soup, french bread and cheese. The monies collected at these lunches totalling £315 was sent to Christian Aid via the Bishop’s Lent Appeal. On Wednesday 28th February the Mayor and Consort of Havant (Councillor Elaine Shimbart and husband Gerry) held a coffee morning supporting Fairtrade Fortnight at the Church of the Sacred Heart and St Peter the Apostle Parish Centre. There were a good many stalls around the hall including Traidcraft gifts, food and beverages etc, a jewellery stall, “Save the Children” sold jams and toiletries, and a table promoting the work of ‘Help in bereavement’, plus an extensive raffle. St Peter’s RC Primary School sang for us, and we enjoyed tea and coffee, and delicious Traidcraft biscuits. The Women’s World Day of Prayer service, traditionally the first Friday in March, which this year was due to be held at St Wilfrid’s Cowplain, was cancelled because of snow. 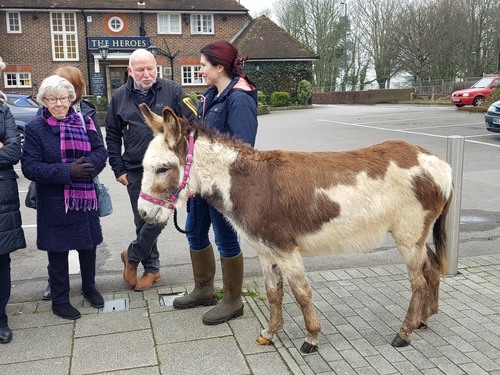 On Palm Sunday we met outside The Heroes pub to process to St George’s with clergy, servers, choir and band, and not forgetting, of course, Smartie the donkey, who we had borrowed complete with her own ‘bucket’ in case of any ‘accidents’ along the way. She behaved impleccably and seemed completely unfazed by the crowd and music following her. There were services each day during Holy Week, the traditional Washing of the feet and vigil on Maundy Thursday and on Good Friday we gathered again at the Baptist Church for our Combined Churches Walk of Witness. 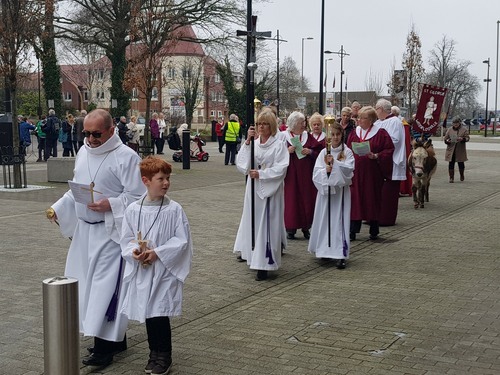 After a second short service at the RC Church we headed for Waterlooville Precinct where in previous years we had stopped amongst the market stalls and shoppers, but this time, due to a ‘technical hitch!’ we had to proceed directly to St George’s. As the weather was rather inclement nobody minded too much about this. 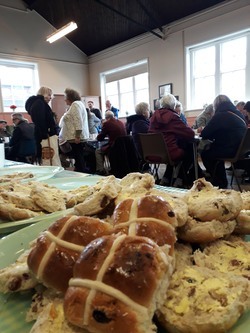 To finish we had tea, coffee and hot cross buns in our Church Hall. At 2pm there was a Good Friday Liturgy Service, on Holy Saturday evening we lit the Easter Fire and new Paschal Candle, and our celebrations finished with two services on Easter Day. 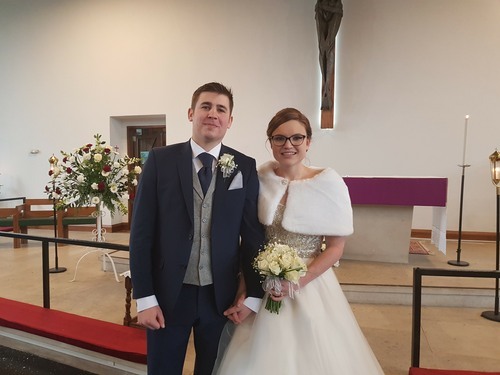 Congratulations to Christopher Marklew and Fleur Williams, whose marriage took place at St George’s Church on Saturday 17th March. 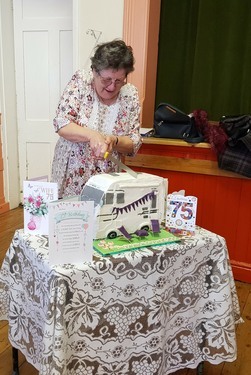 Wendy Clark celebrated her 75th birthday by cutting a cake after the 10am Church Service. On 23rd February, the Tweenies held a “Passage to India” night. 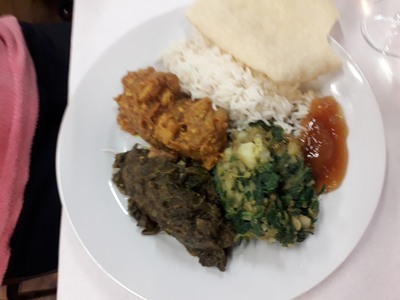 Rachel Palmer shared the photos from her India trip and she and Dawn Hyett prepared some Indian dishes for us all to sample.